Purchase 50 or more Basic Heart Models and download your free support pack worth £100. Purchase 200 or more Basic Heart Models and you can have personalised covers absolutely free! 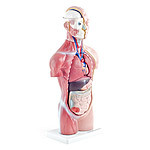 This 2-part, life-sized Heart Model is an excellent training aid as it shows chambers, valves and vessels. Size: 10 x 9 x 15.5cm.